Tomorrow begins week 9 of my walk through the Bible in a year. I hope you are reading along with me. If not, it isn’t too late to start. Just click on the WORD POWER tab and start with week one. Each days reading takes 15 minutes or less and the blessing of accomplishment is quite remarkable. For all the lame pictures I have of pancakes I hope this one picture conveys to you that this recipe is awesome. I started with a cup of all-purpose flour adding whole wheat, cornmeal and some oats. To this I added some baking powder, baking soda (of course), buttermilk (because I always use buttermilk instead of regular milk), a handful of recently purchased new crop pecans direct from Georgia and some fresh frozen blueberries from last year’s garden bounty. 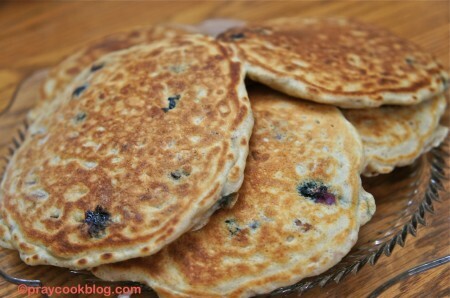 In the end these cakes are light and fluffy, slightly nutty, and popping with blueberries! My chief culinary consultant and my sous-chef dish washer were so happy to eat the pancakes they even forgave me for taking a picture (or two). Mix together all dry ingredients in a medium bowl. In a second bowl, combine Buttermilk, Egg, Vegetable oil and vanilla, whipping them enough to beat the egg. Add these to the dry ingredients, stirring just to combine them. ** Do not over stir. Add pecans and blueberries, stirring in softly. At this point the batter can stand for 10 minutes out of the refrigerator or for an hour or more refrigerated. Heat griddle over medium heat. Grease it lightly if not nonstick and immediately pour ¼ cup batter (or more) to make the pancakes the size you would like. Don't let them get too big or they will be hard to flip. Try to leave space between the pancakes to keep them from sticking together. 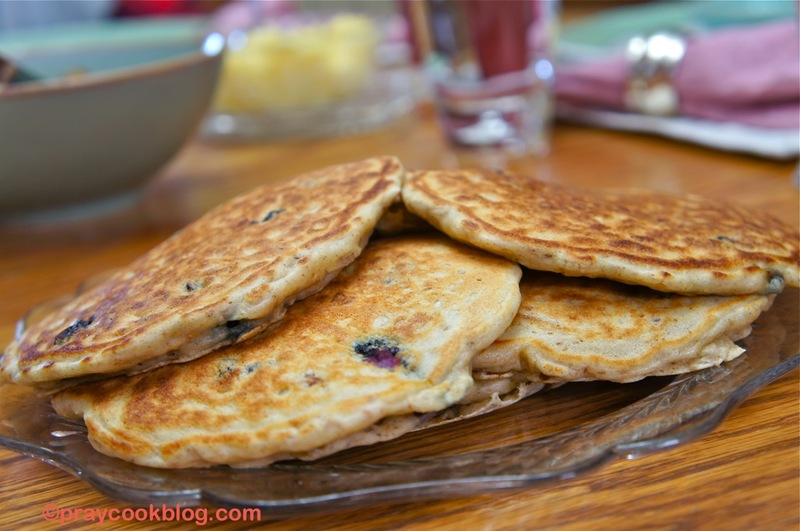 Cook pancakes until the tops are bubbly and the bottoms golden brown. Flip cakes and cook another couple minutes to brown the bottom. Serve immediately with butter and warm syrup. (1) Buckwheat flour can be substituted for the cornmeal, wheat flour, or oats. (2) Whole Milk or 2% Milk with 1 tablespoon vinegar can be substituted for the buttermilk.